It has been a week after the removal of the growths on top of her head, the spay, and the fitting of the new cast. She is healing beautifully. Nala made friends with her foster brother and follows him like a puppy. We have just completed a de-worm treatment and we are certain she will now gain a few pounds. Even with the cast on her leg, she does not walk with a limp and we can't wait for the removal of the cast within the next 2 weeks or so. 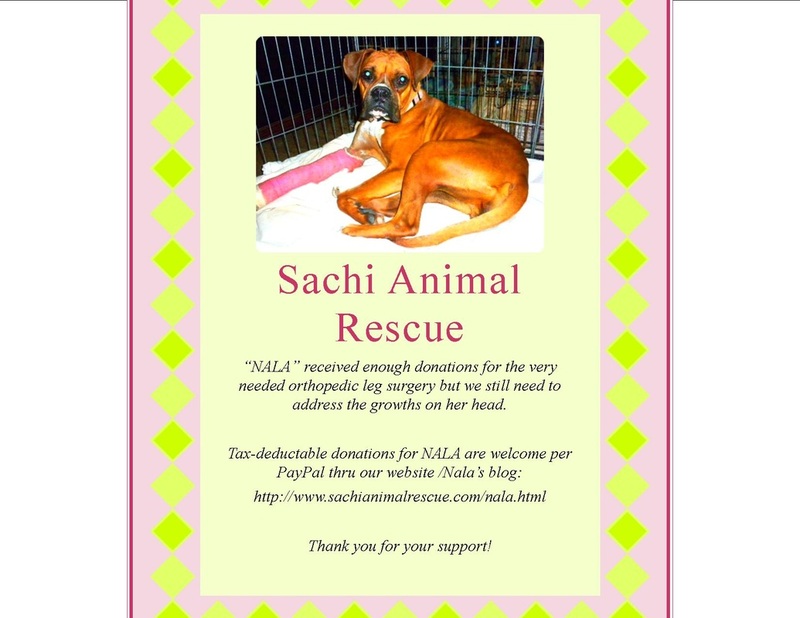 We are hoping for a great home for Nala by mid-March. After a night of observation at the vet clinic, Nala was moved into a temp. foster home where she is being kept crated (as requested by her orthopedic surgeon) for the next two week. Being a young, bouncy puppy, it has been frustrating for Nala to see the other dogs run around while she is only able to watch. As of today (01/31/12) she is being moved to a play pen for a few hours a day. She has full view of the yard, and it is easy to let her step outside to use the bathroom and stretch in the yard every couple hours. Nala is eager to get the treat out of the Kong and that keeps her busy for a while. She eats very well but we noticed some free-loaders in her stool. We'll start her on de-wormer in a couple of days. Other than that, Nala seems to be right on track with her recovery, at least in regards to her broken leg. We still have to deal withthe removal of the growths on her head and the spay. Still need more donation to get that done, hopefully when her cast will be removed in 10 days. 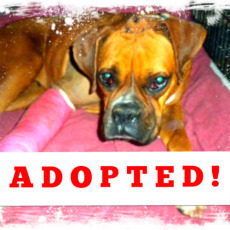 Nala's leg was operated on yesterday by her orthopedic surgeon. She had a complete break in her thigh bone (most likely she was hit by a car). Because she came from the shelter we had though/hoped that this was a fairly new break, that her owners did not let her suffer for long. Not the case, the break was older which made the surgery much more difficult. What the surgeon thought was going to be an hour long, standard procedure took 3 hours. But it went well. Her bone/bones will heal with the help of a plate and screws. For the next 2 weeks Nala is on limited activity. No walking except for potty breaks. After 2 weeks she will get her cast and stitches out. Originally the vets planned to spay and remove the growths from Nala's head at the same time as the leg surgery. Because the surgery was so extensive and long, it was decided that those be done later. The growths are not new and are not expected expand quickly. We need all her energy now to go into healing her leg. Please keep Nala in your thoughts. 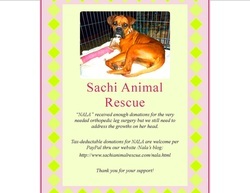 Nala was just saved from a high-kill shelter. She has some medical issues that will be addressed by one of our vets. She won't be able for adoption until the medical issues have been taken care off.